We’re giving pet owners advice on how to look after their animals’ dental health as part of an awareness campaign from January to March 2019. We’re urging people to be vigilant when looking after their pet’s pearly whites, as dental disease among cats, dogs and rabbits is one of the most common problems dealt with at its three branches. 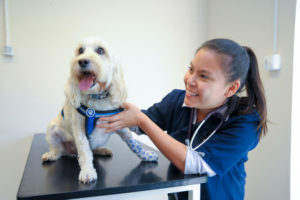 As part of our awareness campaign, we’re offering free dental health checks with a vet nurse at all of its practices from January until March 31, during which nurses will examine pets’ mouths and give advice, if needed, on what treatment may be appropriate. Dr Kevin Wood, our clinical director, said the aim of the campaign was to encourage pet owners to be aware of the risks faced by animals and to prevent issues going forward. Dr Wood said: “Unfortunately, dental disease is extremely common in pets due to a combination of dietary and genetic factors. If we didn’t follow our dentist’s advice and look after our teeth by brushing twice a day, think what our mouths and teeth would be like – pets are no different. Dr Wood also warned dog owners of potential dangers to their pet from chewing on what may seem an innocuous object, such as a tennis ball. Dr Wood said: “Without sounding like a killjoy, tennis balls are not best friends to our dogs’ teeth. The tennis ball fibres collect sand, dirt and grit which can be very abrasive and, along with the tennis ball fibres themselves, they can wear teeth down so the root is left exposed. To find out more the dental health campaign search for us on Facebook.